A wooden toilet seat adds a luxurious finishing touch to a bathroom and can greatly enhance the look and feel of the room. Unfortunately, many ordinary wooden toilet seats can harbour germs and make a bathroom less sanitary due to the porous nature of the natural material. The White Croydex Wood Anti-Bacterial Toilet Seat solves that problem with its unique design that keeps the bathroom free of microbes while still providing all of the appeal of a wooden toilet seat. The wooden seat is finished with a Hygiene N' Clean antibacterial coating that helps to keep microbes from colonizing on the surface of the wood and inside of its pores. As a result, it is a much more hygienic solution for the bathroom than a standard wood toilet seat. 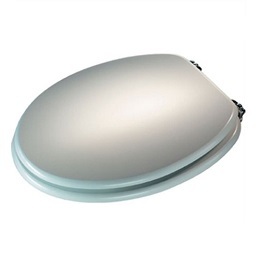 As stylish as it is sanitary, this Croydex Toilet Seat has a sleek white painted finish and an elegant oval shape. The fixings included in the design are chrome-plated, making them both durable and stylish. The unique design of the hinges allows them to be easily adjusted to fit holes centres from 110 millimetres to 200 millimetres apart. The toilet seat has been engineered with ergonomics in mind, so that it is comfortable for users.